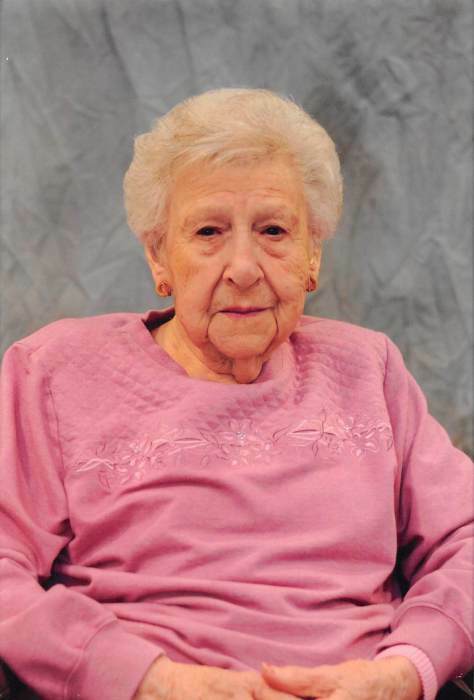 Louise Elvira Donley, 105, of Danville, IL passed February 4, 2019 at Heritage Health in Hoopeston, IL. She was born on March 4, 1913 in Danville, IL, the daughter of Frank and Grace Jeffers Burroughs. She married Elmer Donley September 7, 1936 in Danville, IL. He preceded her in death January 26, 1976 in Crawfordsville, IN. She is survived by sons, Robert (Kay) Donley of Danville, Gene Donley of Westville, IL; daughter, Betty (Earl) Plotner of Platte City, MO; daughter-in-law, Mary Lee Donley of Clifton, IL; grandson, Ron Plotner of Houston, TX; great-grandchildren, Michael Donley of Hoopeston, Dylan Donley of DeKalb and Carly Donley of Bourbonnais; great-great granddaughter, Harper Donley of DeKalb and granddaughter-in-law, Elizabeth Donley of Hoopeston. She was preceded in death by her husband, Elmer Donley; son, Earl Donley; grandsons, Robbie Plotner, David Donley, Mark Donley; brothers, Phillip, Paul, Robert and Richard; sister, Laura Burroughs Shepherd. Louise graduated from Danville High School in 1932. She and Elmer farmed in the Collison and Homer areas until 1961. They moved to Charleston, IL, then to Chrisman, IL where they managed a Standard Gas Station before moving to the New Market/Waveland, IN area to resume farming until their retirement in 1974. Louise moved to Oakwood in 1981 where she was a member of the Oakwood United Methodist Church. In 2009, at the age of 96, she moved from her Oakwood home to Bowman Estates in Danville, where she resided until moving to Heritage Health Care in Hoopeston, IL in 2017. Louise loved her family and home and enjoyed sewing, reading, puzzles, flowers, visiting with family and friends and watching Illini basketball games. A special thank you to the staff and nurses at Bowman Estates, who helped care for her where she always felt like “family” with the staff and residents and also to the attentive care she was given at Heritage Health Care.